Louis Carré & Co., Paris. Anon. sale, Christie's London, 28 June 1982, Lot 36. "Sensuous fullness, an essential feature of modern art is more strongly marked in Léger than in any other painter... . Full bodied colours and forms, full-bodied figures and objects, these meant more to him than the spirituality extolled by others. He was concerned not with the finer mental or spiritual values but with almost physical values: with the power and reality of colours and forms, with the physical presence of human figures. Léger never set out to plumb the depths of the human spirit. On the picture he conferred a sturdy, trustworthy reality of its own." (Fernand Léger quoted in, W. Schmalenbach, Fernand Léger, London 1976, p. 44). Throughout his long and highly influential career, Fernand Léger always sought to create an objective and unsentimental art that would both appeal to and satisfy the idealised anonymous collective society of which he dreamed. A no-nonsense, practical man of unshakeable confidence, Léger sought to express and shape modernity through simple pictures made for simple people. Executed in 1949, Deux femmes tenant un pot de fleurs is a typical example of this radical aim. A bold and forthright painting, it is a striking work that openly expresses a vision of the order and virtue of the modern arcadia for which the artist strove. Consisting entirely of strong colours and simple forms, Léger depicts two heavily modelled and monumental-looking figures that assert a powerful material presence and sense of reality from within the painting. As often in Léger's work, the two women hold a pot of flowers which like a still-life forms a vibrant inanimate centre to the composition. Women holding flowers in Léger's paintings were a means by which the artist could indicate women's close affiliation with the natural world. However, neither flowers, nor any other object were ever to be construed as an attribute or of being of lesser importance than the human figure. If anything, the opposite was often true. For as Léger repeatedly pointed out, he considered it essential in his painting that objects and people should enjoy an equal status and in order to clarify this point he often deliberately relegated the importance of his figures and portrayed them in as object-like a manner as possible. "For me," Léger proclaimed, "the human body is no more important than keys or bicycles.....for me these are valuable objects to make use of as I choose... the object has replaced the subject, abstract art has come as a total liberation, and the human figure can now be considered, not for its sentimental value, but solely for its plastic value." (Fernand Léger quoted in, 'How I Conceive the Human Figure' (1949), reproduced in The Functions of Painting, Fernand Léger, London 1973, p. 155). The "contrasting values" that Leger refers to are asserted in the present work by the way that the work has been constructed like an abstract picture, but with forms of such recognizable solidity and material presence that the work asserts a reality all of its own. Though executed in the manner of an abstract construction, Deux femmes tenant un pot de fleurs, is nevertheless a recognizably figurative painting. Its subject matter, though of lesser importance to the compositional order and physical presence of the work, is clearly also both relevant and appropriate. 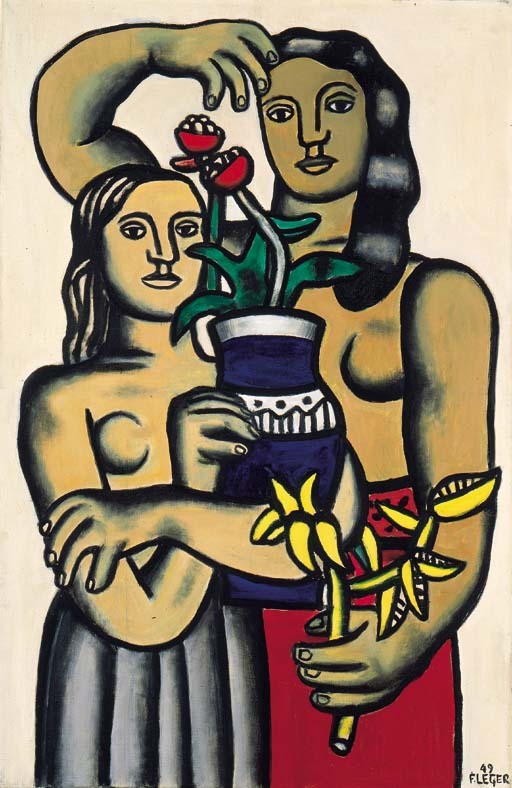 In Deux femmes tenant un pot de fleurs, the strong frontality of the figures, their simple rendering and their nakedness all support Léger's stated aesthetic aims in the way that, like, Gauguin's painting.... they are instantly recognizable as a representation of the virtue and benefit of a simple natural lifestyle. In this respect Deux femmes tenant un pot de fleurs, relates closely to the important series of paintings on the subject of rest and recreation that Léger executed in the late 1940s and early 1950s. Centring on such themes as country outings and simple open-air living, this late series of paintings represented the development in Léger's idealism and imagerie populaire . A growth of his early beliefs in mechanised modernity offering the finest hope for man's progressive and social evolution into a wider worldview that embraced rest and recreation as being the true symbols of man's freedom and happiness. With its strong composition, bold style, and plain colours Deux femmes tenant un pot de fleurs asserts the core principles of Léger's art while at the same time projecting a powerful image of Léger's idealised social utopia. The two women, both healthy and strong, are idealised social types who are living the modern, classless and natural life in the social utopia Léger was confident the post-war era would bring. All through his life Léger's innate positivism and optimism for the future had characterised his art which he believed had a vital role to play in re-establishing the simple values on which such an earthly paradise could function. As the striking simplicity and directness of Deux femmes tenant un pot de fleurs illustrates, the essence of his aesthetic was the message: "Look! How beautiful our world is! The new art brings peace and happiness." (Fernand Léger cited in, W. Schmalenbach, Fernand Léger, London 1976, p. 156).